Now that the dust has settled from SXSW, we’re poring over the best stuff from the trade show, points made at panels, and what we saw at the first ever SXSW Music Hackathon Championship. Expect more coverage there soon, but for now, what concerns us is the Auto-Canonizer, from the hackathon. 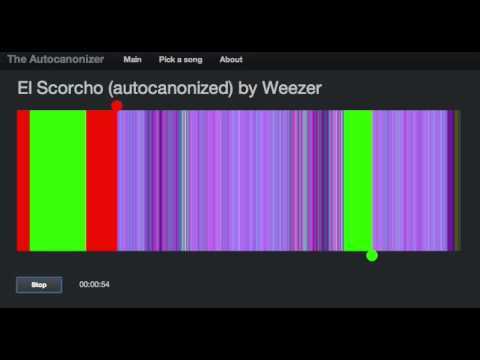 At the SXSW Music Hackathon Championship last week, one of our favorite creations was Auto-Canonizer by Paul Lamere (director of developer platform for The Echo Nest, publisher of Evolver.fm). It analyzes any song you upload, looking for segments that would harmonize well with each other (Lamere explains), then plays them at the same time. Yes, it turns any song into a canon of sorts, thus its name. The Auto-Canonizer has different effects, depending on what you feed it. The app can remake a normally sweet, almost cloying ukulele version of “Somewhere Over The Rainbow” into unresolved stasis, and even turn Adele’s “Someone Like You,” which you’ve heard a million times, into something new. Read more about the Auto-Canonizer on Music Machinery.